2016/17 Ukrainian League. 26th round. April 21, 2017. Kyiv. NSC Olympiyskyi. Attn: 51,732. +4oC. There were 11 points between the teams, with Shakhtar staying on top with 66 points and Dynamo coming second with 55 points earned. In the previous round, both opponents gained the upper hand in their fixtures, however, if the Pitmen claimed a comfortable victor over their landsmen from Olimpik (4-0), then the Kyiv won a close game over Zorya (1-0). An unbeaten streak of the Orange-and-Blacks versus Dynamo started in 2014 and totals eight meetings now. 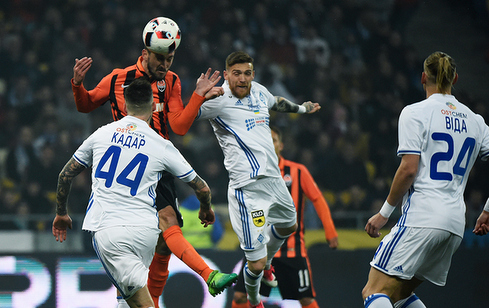 In the current season, the opponents locked horns with each other twice: the first clash ended in a 1-1 draw in Kharkiv, with Shakhtar sealing a striking victory in the capital (4-3). Both mentors were able to field the optimal starting line-ups. Therefore, experienced Kucher and Rakits’kyy played in the centre of the Pitmen’s defensive line, as Stepanenko made a good pair to Kovalenko in the midfield, and Paulo Fonseca, choosing between the two Argentines on the attacking end, preferred Ferreyra. SerhiyRebrov have not made changes to the tactics that yielded in in the latest matches, and again operated using a 3-4-3 formation. The clash kicked off with counter attacks, and as early as inside the third minute, they saw the ball inside the visitor’s goal. Before then, however, Yarmolenko commited a foul on Ismaily, before the goal was justly ruled out. Shakhtar responded with a series of rapid attacking moves. Following one of them, the hosts’ goalkeeper beat Ferreyra to it just for a moment after Stepanenko played a through ball. However, already in the 12th minute, the Pitmen took the lead. The opening wave of the attacking move came to nothing, but Taison got the ball at his feet in the left wing of the penalty area, before delivering a cross to the far post, where Facundo Ferreyra beat Antunes in the aerial challenge with Kadar and nodded the header into the far corner to make it 0-1.The Donetsk side could have immediately doubled their lead: Bernard connected with a lift over from Marlos and rushed out from behind the defenders’ backs to go one on one with Koval, but the goalkeeper showed reflexes to deny the Brazilian’s effort. From that point on, the visiting team took a firm grip on proceedings in the course of the match, enjoying a long spell of possession at the other end of the pitch and not allowing Dynamo to approach Andriy Pyatov’s goal at a shooting range. In that situation, the hosts could not make the best of a bad job except delivering crosses inside the penalty area, but Shakhtar players coolly won challenges . As a result, for the entire first half, the White-and-Blues registered not a single effort at visitor’s goal. The second half started with a series of corners near the Pitmen’s goal, but the Donetsk side’s counter-attacking performance looked more threatening. On the left flank, Bernard waltzed through to the goal line and flicked a cross, with none of his teammates being able to connect with it. Immediately after that, the Brazilian stole the ball in the midfield and instigated an four-on-three counter, played in to Ferreyra. Facundo decided to shoot from the edge of the penalty area to see it flying over. The better part of the second period saw the teams challenging in the midfield, although Dynamo made an attempt to go forward in numbers. The Kyiv side counted on set pieces and crosses from the flanks, which Pyatov easily denied. Throughout the closing ten minute, they managed to create a couple of clear-cut opportunities, as emerging in a good position Pantic underhit the ball straight into the keeper’s hands, and Besedin failed to tap in a cross by Antunes. 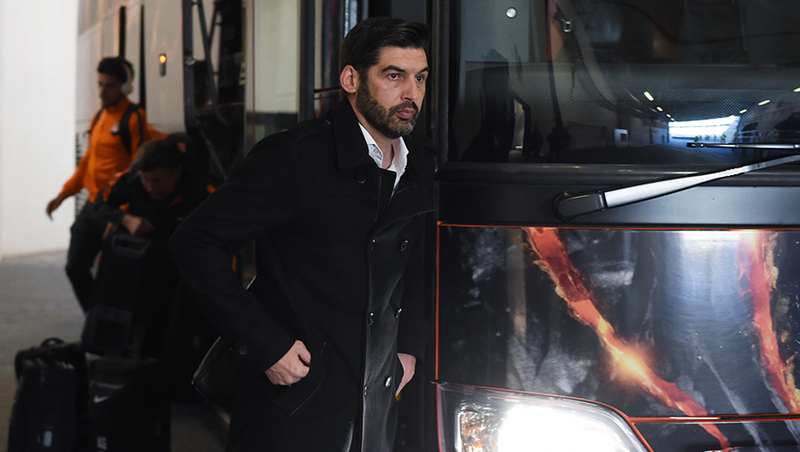 Other than that, the defence of the Orange-and-Blacks operated without failures, so Paulo Fonseca’s guys coolly brought the match versus their arch-rival to a victory. 1-0 - Shakhtar claim a win in another Ukrainian Clasico, with the Donetsk side extending the lead over the runner-up to 14 points in the standings. The Pitmen are to hold their next fixture on April 26 in Kharkiv. In the Ukrainian Cup semi-final, Shakhtar will meet with Dnipro at the OSC Metalist. The kick-off starts at 20:00.